Deadline for Registration - to receive a race shirt is February 10, 2019. Deadline to participate prior to race day - Thursday, March 1st! The first 500 participants to cross the finish line will receive a race medal to commemorate the event. 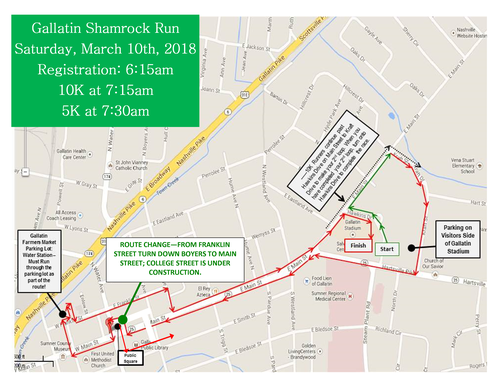 The Gallatin Shamrock Run is presented by the Gallatin Chamber of Commerce to benefit the Gallatin Chamber Foundation, a 501(c)3 organization. 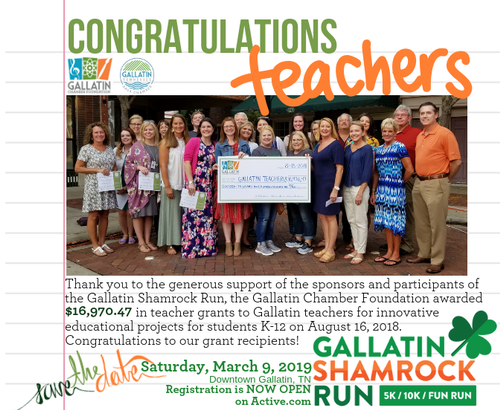 Proceeds will be used to fund innovative educational grants for teachers K-12 in the City of Gallatin. Join us for a fun run through Historic Downtown Gallatin, Tennessee. This primarily flat course is great for runners and walkers of all ages and ability. The 10K participants will run the 5K course twice and have a little over 90 minutes to complete the race. Participants in the 5K will be grouped by estimated completion time and have 60 minutes to finish. The roads will open back up at 9:00am/9:15am. Anyone who has not completed the race will be asked to move to the sidewalk to complete their race. 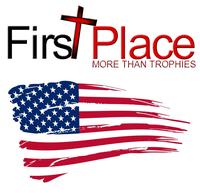 Prizes will be awarded to top finishers male and female, and awards will be given for the best St. Patrick's Day costume and the most team spirit. Registration will open at 6:30 on race morning. The 10K race will start promptly at 7:15 am with the 5K run/walk kicking off at 7:30 am. All participants must complete the race by 9:00am. *Participants must register by February 11, 2019 to be guaranteed a race shirt. First 500 participants to cross the finish line will receive a commemorative race medal! 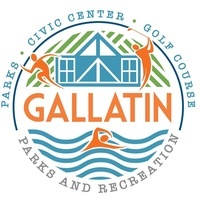 Packet Pick Up will be Friday, March 8, 2019 from 10:00am to 5:00pm at the Gallatin Chamber of Commerce, 118 W Main St in Gallatin, TN and at 6:30am at registration. Click Here ​ for a paper application. Registration is now open on Active.com, and by paper application.